Chawton House’s Dyers Barn is the new, larger venue for the Antique, Vintage, Craft & Gift Fair, previously held at Chawton Village Hall. There will be up to 30 stalls inside and outside offering a plethora of interesting and unusual items for purchase. Find collectible books and china; quirky curios; clocks; vintage clothing and hats; kitchenalia; ephemera; hand sewn and knitted items; hand turned wooden pens; upcycled furniture, jewellery, cards and Victorian, Edwardian and Georgian antiques, plus lots more. As well as a variety of stalls available for visitors to browse, tea and homemade cakes will be served in the Grade II listed Dyers barn on the Chawton estate. 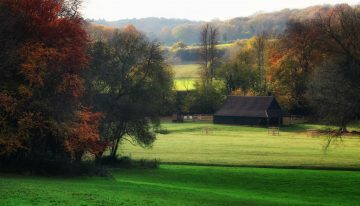 The barn was previously based in Alton and once belonged to the Dyers family, before it relocated to the grounds at Chawton House. Visitors may also walk up to Chawton House for lunch in the Old Kitchen Tearoom. There are several Easter activities taking place in the house for visitors of all ages to enjoy, including an egg trail, Regency bonnet making and old-fashioned parlour games. The Chawton House Antiques Fair takes place on 21 April, Easter Sunday. Doors open 10am until 4.00pm. Entry is £1.50 with under 14’s free. There is ample parking available next to the venue, free of charge.